A force acting on an object may cause the object to change shape, to start moving, to stop moving, to accelerate or decelerate. When two objects interact with each other they exert a force on each other, the forces are equal in size but opposite in direction. 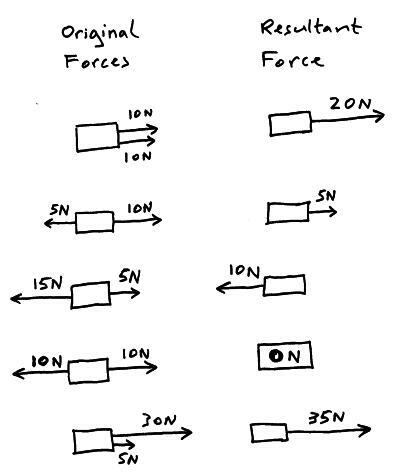 The forces acting on an object can be replaced with a single force that causes the object to behave in the same way as all the separate forces acting together did, this one overall force is called the resultant force. All forces (F) are measured in newtons (N).